Jane Foster, at the end of everything in The Mighty Thor #705. Since last October, Mighty Thor has been running a storyline called “The Death of Mighty Thor.” This week, that storyline lived up to its name. 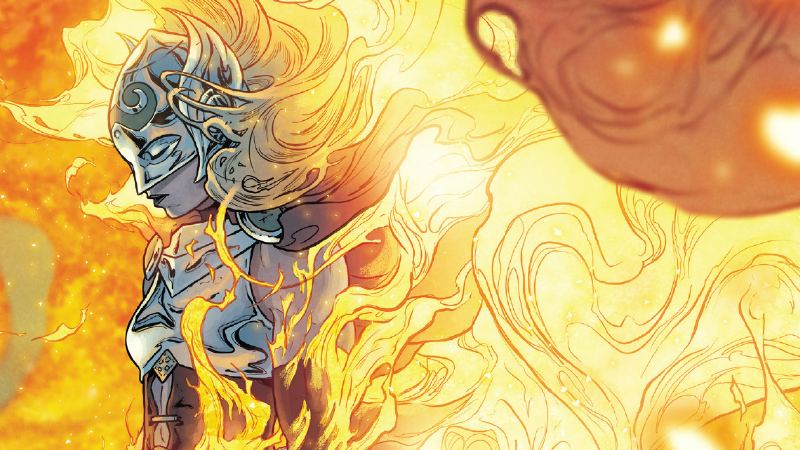 In reality, Jane Foster’s final end came in the climactic moments of Mighty Thor #704 last month—when Jane chose to transform into Thor one last time, against the wishes of her friends, after her cancer progressed too far to treat. It was a last-ditch attempt to save all of Asgard from the murderous rampage of the Mangog. The inevitability that Jane’s death—once she transforms back from being Thor—has basically already happened gives all of this week’s Mighty Thor #705 (by Jason Aaron, Russell Dauterman, Matt Wilson, and Joe Sabino) a funereal tone. Tragedy pervades the issue—it’s genuinely heartbreaking to watch Odinson, one of the few people around to actually know who Thor is underneath the mask, howl in anger and grief when she arrives to fight the Mangog. Every page turn is taken with the knowledge that by the end of it, Jane Foster will be gone. But there’s also a lot of hope in it, too, thanks to Jane herself. Even in her final moments, Jane Foster has time to be an absolute badass. The last thing she tells the still-fleeing Asgardians as their home crumbles and plummets towards the sun is that she’s chosen to sacrifice herself so that they can live, and to earn the love and faith of the mortals that believe in them. When the Mangog needles Jane—vaguely aware that she’s not quite wholly a god—about why she’s chosen to give her life for people that, on the whole, don’t actually care for her, when it would be so easy to give in to her own hate for them and just stand aside, Jane’s answer is similar. Fighting because of hate is easy. Fighting for love? That takes the strength of a woman like Jane Foster. When the time actually comes for Jane to make her sacrifice, with Odinson at her side, she does so not by the Mangog’s hands, but by letting go of the one thing that’s kept her going: Mjlonir. Wrapping it and Mangog in chains made to bind Fenrir during Ragnarok itself, Jane gives one last command to her constant companion as the Goddess of Thunder—the thing she has feared losing the most during her time as Thor—and casts it off to the sun, seemingly destroying both the hammer and Mangog in the process. Jane and Odinson say goodbye. It leaves little time for more than a goodbye between two Thors, a bittersweet kiss that ends a decades-long relationship as the Mighty Thor fades away, leaving nothing but the body of Jane for Odinson to cradle in his arms. A fitting end, found in love, for a woman who so dearly championed it, in her lives as a doctor and as a goddess. There is still one more issue of Mighty Thor to go, before this excellent creative team splits up (writer Jason Aaron, at least, will continue in the new relaunch of Thor with artist Mike Del Mundo), an epilogue to Jane’s remarkable time as the Mighty Thor. Given that this is comic books we’re talking about, there’s always a chance there’s some surprising way that Jane herself is brought back from the grave, even if she can no longer be Thor. It seems unlikely, given the finality of this issue, but even if it does happen, it doesn’t change this: the Goddess of Thunder is no more.